An cast bronze conduit cap with bolt pressure cable holder machined to fit snugly over 1 1/2" Schedule 40 PVC conduit. Internally threaded brass hex stock adapter extends below. Stainless steel nut and washer. Overall height 2.8" (7 cm). Approximately 12.8 oz. (363 grams). 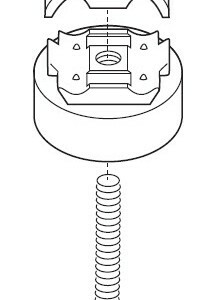 Specify 3/8 or 1/2 internal thread size when ordering.